A sandstone block built from lego, blending real objects with 3d prints #3dthursday « Adafruit Industries – Makers, hackers, artists, designers and engineers! By combining 3d scanning, 3d digital modeling, and 3d printing, it is possible to create amazing and surprising effects, objects that can seamlessly blend between reality and imagination. 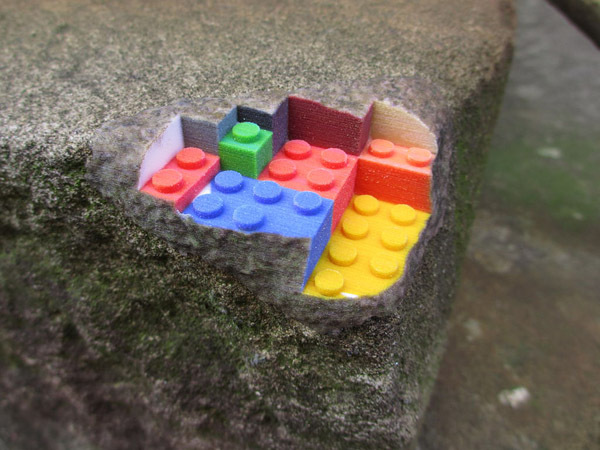 In this tutorial, I describe the process of making a full colour 3d printed object that seamlessly fits on to a real sandstone wall, producing the illusion that the wall is built from pieces of lego. But the techniques described have a more general usefulness, almost limitless potential, and are easier and less expensive than you might think! 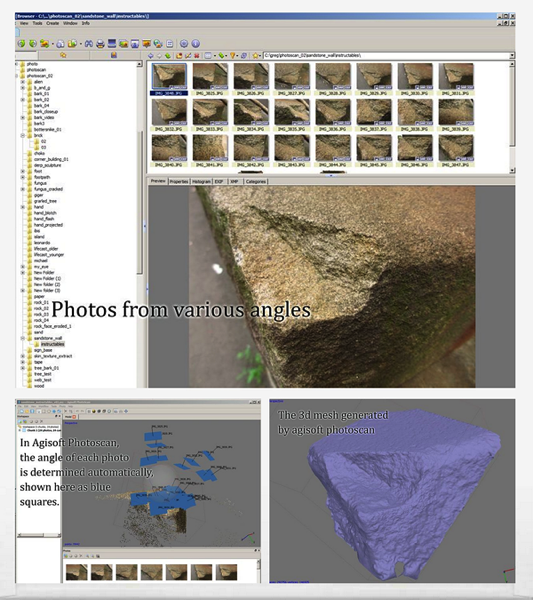 Staring with a real physical object, in this case a sandstone brick wall, I create an inexpensive but high quality digital 3d scan using a stills camera and the program Agisoft Photoscan. I then model the lego brick shapes over this scan using 3d software, I make this model fit perfectly onto the scanned wall by using boolean subtraction, I add colours clone stamped from the photos, correct the scale, and finally I do a colour 3d print, which fits seamlessly onto the sandstone wall, producing a novel illusion that would be difficult to achieve by other methods….